This section is in water but not connected to the “navigable” sections. It is suitable for canoes and similar portable craft. Leaving Bridge No.130 with its canal side property we find a winding point. 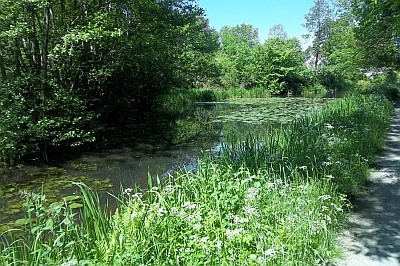 This is an attractive area when the Water Lilies are in flower . Walking along the towpath, this attractive period cottage catches your eye. 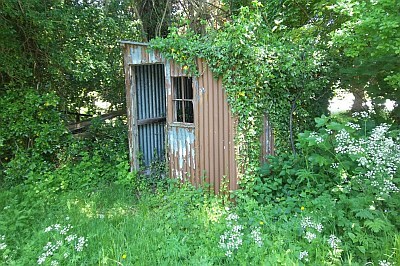 This old Canal Side Cabin is still evident at Garthmyl. 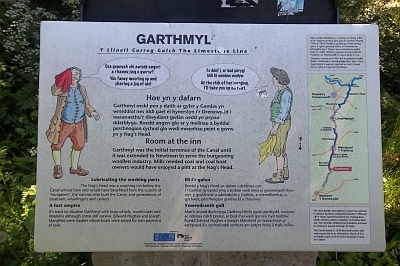 Garthmyl was once a busy industrial settlement with Lime Kilns, Maltings with Drying Kiln, Wharves, Warehouses and Stables. This Information board is sited just past the cabin. 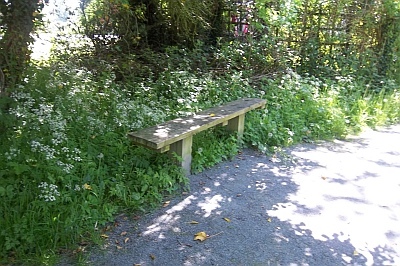 Also sited near the Information Board is this seat. 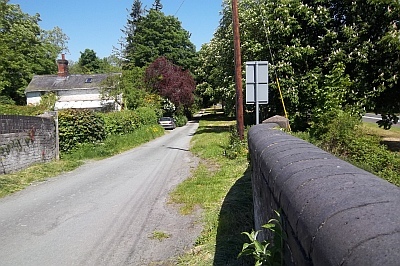 Bridge Number 131 at Garthmyl. As seen in the next photos. The tow-path no longer passes below the bridge. 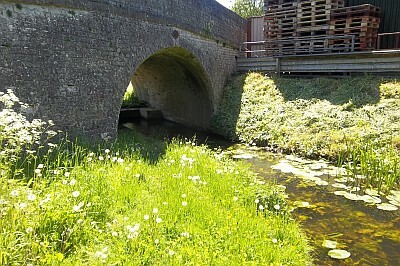 View under Bridge 131 at Garthmyl. 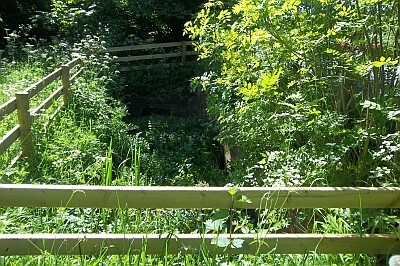 The canal enters a culvert at this point. A pipe carries it across and under the A483 Trunk Road. 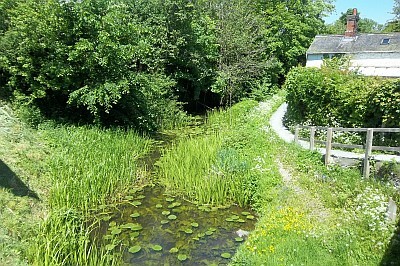 Seen from the top of Chain Garthmyl Bridge (Bridge No. 131). 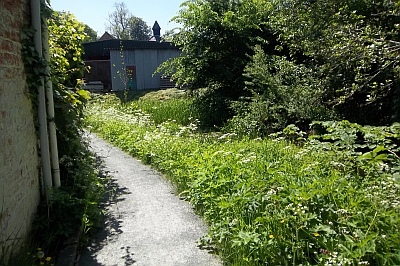 The towpath no longer passes under the bridge but rises up to reach the road at the point shown in the top left of next photo. This view was taken from the top of Bridge No. 131 looking in the direction of Welshpool. The road that you are looking along was the main A483 trunk road before it was by-passed with the new road. 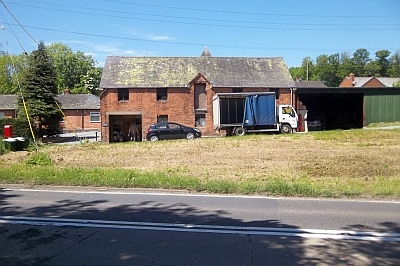 Seen from across the A483 Trunk road showing the present alignment of the road and canal. 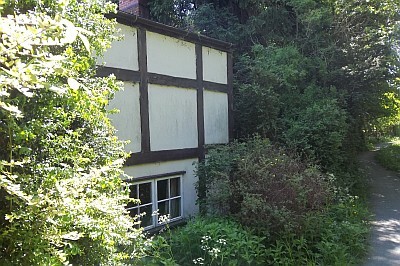 One of the original Warehouses at Garthmyl that is still in use. 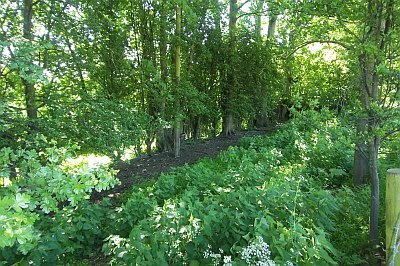 Sited adjacent to Bridge Number 131 which is to the right of this photo. 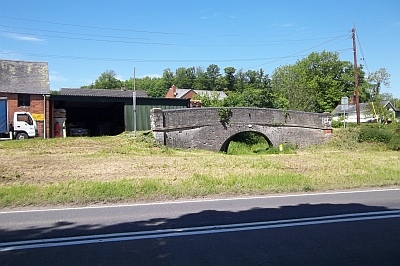 Across the busy A483 Trunk Road you will find evidence of the original course of the canal. 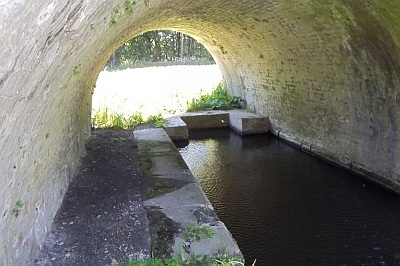 The canal water is now piped under the road from Bridge Number 131 and then following this course alongside the road before crossing the Montgomery Road under the flatted Nags Head Bridge Number 132. By the side of the Montgomery Road. This is where the pipe carrying the water under the road from the western side comes to the surface before being piped along under the old course of the canal and across the A483 Trunk Road to Bridge Number 131. CLICK HERE to go to Page 2 of this section.